In Palm Trees and Snowflakes, Scott Bury proves a good author doesn’t need a lot of words or a lot of pages to tell a brilliant and compelling story. The novelette is short. The power it packs is explosive. 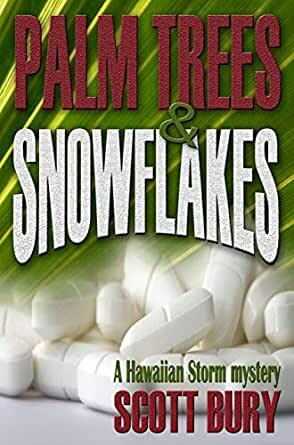 Le Crime Series has given him a wonderful background: Hawaii, steep with mystery, intrigue, and folklore. It is an island that can be as deadly as it is beautiful. FBI agent Vanessa Storm has known it for a long time. She finds out once again, up close and personal just how violent a few minutes in her life can be. A designer drug has found its way into the islands. Want a perfect high? This is the drug for you. Want to die? Don’t take it. The drug, known as Snowflake, will kill you. Vanessa Storm is facing the holidays. She plans to go home for Christmas. Now she only hopes she will survive the holidays and live through Christmas. Scott Bury has the ability to crawl into your psyche and imagination and leave you stunned at what you’ve just read. He doesn’t simply put Hawaii on the printed page. He leads you inside Hawaii, and you feel the same fear that confronts all of his characters. Scott bury is a master storyteller. 5.0 out of 5 starsDon't mess with Special Agent Vanessa Storm! Having read and loved this novella as a KW story, I received an ARC from the author of his rewrite. It's been 3 years, but his main character, Vanessa Storm, FBI Special Agent, is still one of my favorite B*A (heh, heh) females! I truly enjoyed rereading this story again. It's action-packed right from the first chapter as Vanessa tries to shut down the import of a designer drug that's killing young people. She receives some help from an unexpected source (who complicates her life a little more!). AND - she has a cat! You'll love this short read! 4.0 out of 5 starsVery good story! I received an ARC for this book and am voluntarily posting my review. I am glad that I read early reviews, which suggested that reading the first book (Torn Roots) in the series would help in understanding this short story. This has an interesting plot and holds your attention throughout the book. I was entertained by it, so I will likely read more of Mr. Bury’s books. I hope he continues to develop the main character, FBI Special Agent Vanessa Storm, as well as some of her associates, to add more depth to the stories. 5.0 out of 5 starsLightening fast!